Q: What are the system requirements for the Mac apps? PhoneLog and PhoneLog Pro need macOS 10.11 (El Capitan) or later. They have been tested and are also compatible with all versions of macOS released since then: 10.12 (Sierra), 10.13 (High Sierra) and 10.14 (Mojave). Q: What are the system requirements for the iPhone & iPad app? 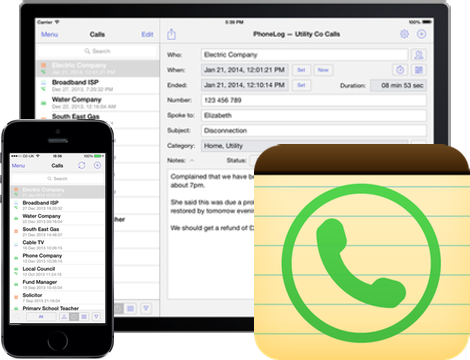 The latest version of PhoneLog for iPhone & iPad requires iOS version 9 or above. It has been tested and also works fine with iOS10, iOS11 and iOS12. Q: Are iCloud syncing or iCloud Drive supported? A: No. 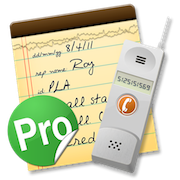 In order to sync a call log between computers or devices, PhoneLog Pro has an in-built syncing mechanism based on Dropbox or a shared drive (please see the help files above). iCloud is not supported for any PhoneLog app and it is recommended that you do not store your call log on your iCloud Drive as opening it on two different Macs or devices at the same time can cause irreparable data loss or corruption. This may also cause strange behaviour such as random closing and reopening of the call log window. If iCloud syncing is a requirement, then please let us know at the contact email addesss below. Q: Why did Dropbox syncing stop working for older versions of iOS and macOS in June 2017? then Dropbox syncing stopped working from 27 June 2017. To continue syncing, please upgrade your device's software to the versions above and ensure that you have installed the latest version of PhoneLog. Technically, the reason for this disruption is that Dropbox turned off their 'version 1 API' that apps use to sync files on 27 June. They replaced it with a 'version 2 API', but the toolkits that they have provided to app developers to communicate with this new API are only compatible with the OS versions above. We would like to apologise for the inconvenience, but unfortunately this is beyond our control. Q: Is it possible to use both PhoneLog and PhoneLog Pro at the same time? A: Yes, but this probably isn't very useful. It is expected that after you upgrade you will probably want to uninstall PhoneLog. All the features in PhoneLog are also available in the Pro version. 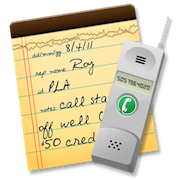 Q: How do I share a call log with someone else who only has PhoneLog, not PhoneLog Pro? A: You can use the Export feature in the File menu of PhoneLog Pro to export the file as a PhoneLog XML file. Please see the PhoneLog Pro help file above for more details on compatibility. Q: What are the plans for future releases? Various enhancements are planned for PhoneLog Pro and PhoneLog for iPhone & iPad and we are always open to feature suggestions. Please let us know by using the mailing link below. Please let us know what app you are using and what version. This information can be found in the About option in the application menu to the right of the Apple logo in the menu bar. We'll try to answer your email as soon as we can.